Qantas’s experiment with long-haul travel for the last year, Perth to London, has been a huge success. The Dreamliner has been working at an impressive 94% occupancy throughout its service on this route. This just goes to prove definitively that there is a huge market for direct travel between Europe and Australia. Qantas was keen to announce that their one-year-old London to Perth route had been highly profitable and a big success for the company. He also mentioned that part of this success was that the route turned a profit from day one, normally rare in the airline industry. Looking at the figures, of 94% occupancy and only four cancellations in an entire year, it is no wonder why Qantas (and customers) are exceptionally happy with the route. What does this mean for Qantas going forward? Turns out passengers are willing to fly on one plane for longer, rather than transfer at a hub between two shorter flights. It’s this notion that Qantas is keen to capitalize on, now that they have proof of the success of the London to Perth route. Qantas wants to expand services from Perth airport to other European countries, such as Paris, Spain and Germany. However, Qantas is currently in a dispute with Perth airport for lack of payment. Project Sunrise envisages flying aircraft from the Australian East Coast to locations in the UK, Europe and perhaps even North America. Currently Qantas is evaluating which aircraft to choose for the job, with the 777X and the A350 under consideration. 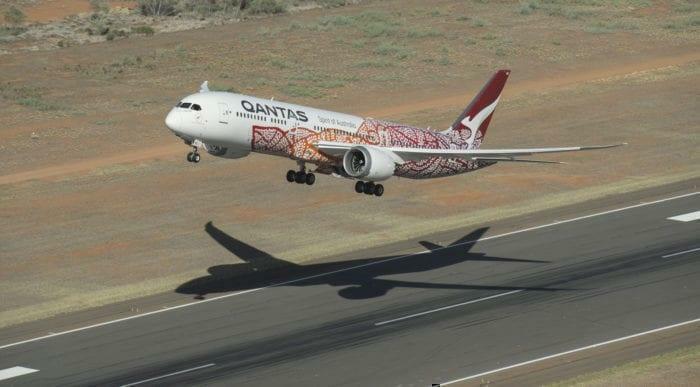 Both could theoretically perform well, but Qantas is keen to challenge the two manufacturers to see who can create a perfect solution for their needs. 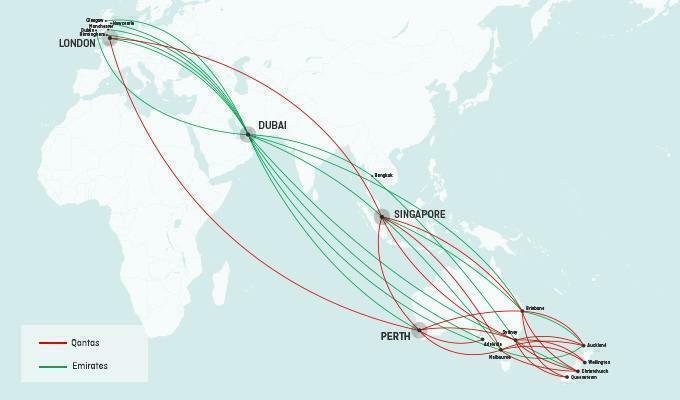 As you can see from the graph below, Qantas currently has to fly their aircraft to Singapore before heading to Europe (apart from London to Perth). If they were able to skip Singapore and head straight to Europe, it would massively change how the Australian economy develops. With superb results from their first year of direct Australia to Europe travel, the future for more ultra long haul routes is looking bright. Ultra long haul routes are a blessing for the aviation industry and their passengers, presuming aircraft have an occupancy of 90% +. Straight flying is not only comfortably time saving for passengers, it boosts the aircrafts utilisation for an airline. •	The longer the route, the more fuel should be carried in the early stage of the flight. But it saves an extra midway start, with all other flanking costs. There certainly ’ll be a breaking point from which it’s of no sense flying further, even if a specific type of aircraft could make it. •	Such a long in the air time requires more crew on board, enabling them to work in shifts and take some rest. But part of the cabin crew tasks can, especially on these long flights, be done by EC-passengers themselves by picking up their meals and drinks at the pantry with one way traffic in a two aisles plane. It’s a healthy kind of in flight activity. It saves a lot in cabin crew effort and so extra staff on board. Businesswise this workflow could even be typically beneficial for an airline. That’s why I even dare to guess ultra long haul flights could be cheaper than those with intermediate stops. All together they offer at least a threefold profit, besides the environmental gain in less pollution and disturbance of missing all those midway stops. I’m a long-time airline and aircraft manufacturer employee (now retired) and aeronautical enthusiast. I’ve noticed over recent years that the term ‘direct’ has been used instead of ‘non-stop’. ‘Non-stop’ is defined as a flight that does not stop between origin and termination of the aircraft and its flight number. A ‘direct flight’ is where the same aircraft, by tail or registration number, is used for a flight number that is scheduled for multiple stops using the same aircraft. ‘Non-stop’ is still a big deal for airline marketers. It was a big deal years ago. It still is today.